Immobilisation of the wrist joint for restriction of motion, pain relief, joint alignment, functional support, and/or positioning for healing. A variety of acute and painful wrist and hand pathologies may benefit from immobilisation with a circumferential wrist orthosis. 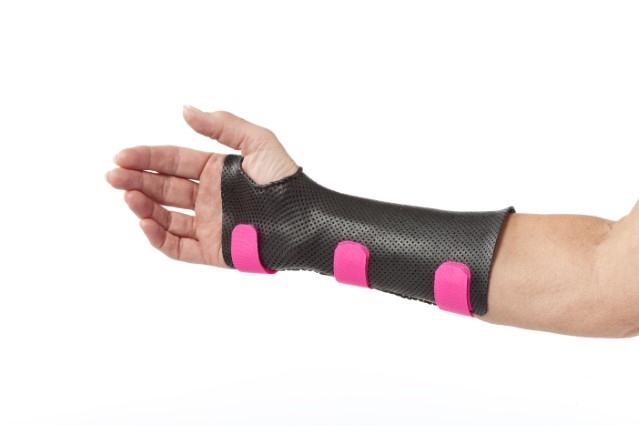 The circumferential wrist orthosis, encompassing both volar and dorsal surfaces of the forearm, can be extremely rigid and strong, allowing for excellent fracture stabilisation, post-operative protection, and strong support. The therapist can utilise a thinner material such as a 1,6 mm (1/16)”, 2,0 mm (1/12”) or 2,4 mm (3/22”) thermoplastic material because there is stabilisation on both volar and dorsal surfaces as well as lateral protection. 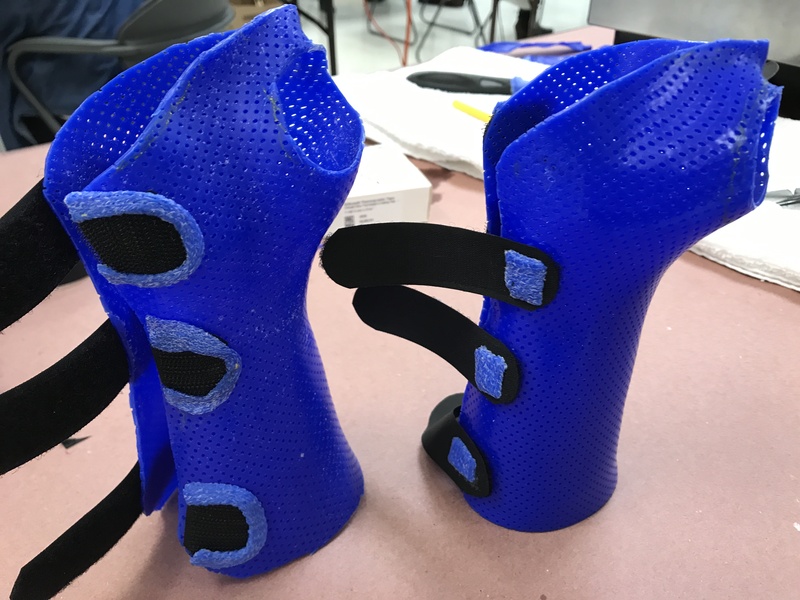 A circumferential orthosis is typically not as heavy or as bulky as a clamshell design, which includes both a volar designed orthosis and a dorsal orthosis placed on top. And it is much easier to don and doff than the clamshell design. The circumferential design may also help with oedema management, providing even compression all around the swollen extremity, along with circumferential strapping. This can be further enhanced with a compression sleeve worn underneath the orthosis. A circumferential orthosis makes an excellent base for all outrigger attachments, (either on the volar and/ or dorsal side) because it does not migrate distally with force directed on the fingers. 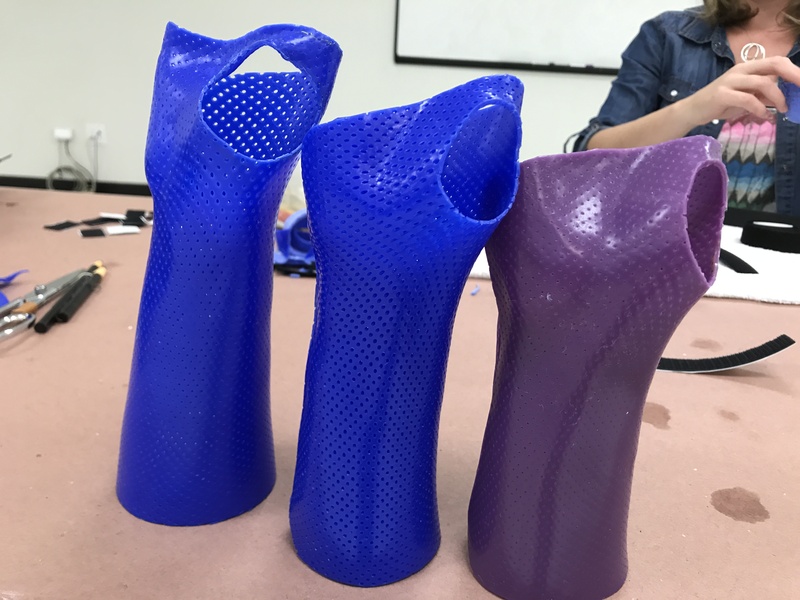 Circumferential orthoses to support the wrist on both volar and dorsal forearm surfaces can be fabricated from a thermoplastic material of 1,6 mm, 2,0 mm, or 2,4 mm (1/16”, 1/12” or 3/32”) thickness. This easily provides adequate support for most adults and creates a more lightweight and comfortable orthosis. But 3,2 mm (1/8”) thick materials can be used when needed (due to the size of extremity, etc). Materials with excellent elastic stretch and full memory are well suited for this orthosis. And it is extremely beneficial to select a non-stick coated material for ease in separating the overlapping ends when cooled. The non-stick coated materials do bond together temporarily when heated, allowing the therapist to position the extremity as desired using two hands. Then the overlapped or pinched material ends can be popped apart when the material has cooled and hardened. Excess material can be trimmed away easily. In addition, Orfit Industries offers pre-cut circumferential orthoses, called Gauntlet Immobilization Orthoses in beautiful and bright colours for quick and easy fabrication. Make sure to order the correct size by measuring the width of the hand at the MCP joints.